Bilstein offers one of the best names in shocks and backs it up with overall quality! This is a great OE replacement for your tired and worn out stock shocks while adding the option to level or lift the front of your rig. 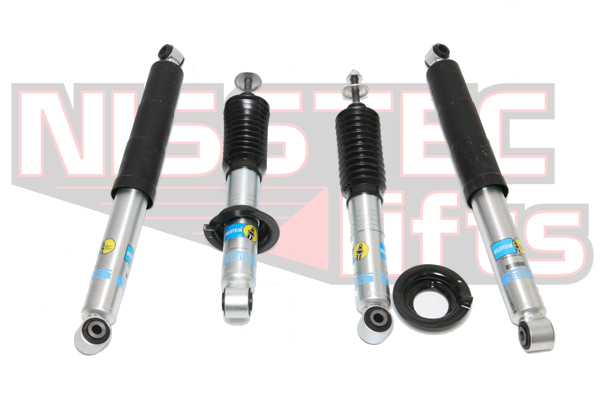 - (2) Front Height Adjustable Bilstein 24-187053 5100 series zinc plated shocks. Adjustable in .5" increments from 0 to 2" of front lift with stock springs. - (2) Rear Bilstein 51XX series shocks. For all rear lift height shocks above 2.5", we highly recommend extended rear brake lines. For all heights above 3", you may need to extend the rear frame side bump stops to keep from crushing the shock can on full compression. Call us for details or to order extended bump stops.